Ballot papers stacked in Dedoplistsaro, ready for delivery to polling stations. Family voting. 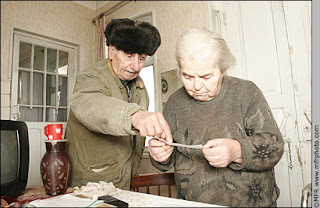 An old man tells his wife how to vote. 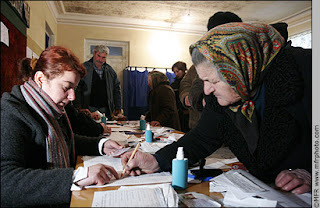 A voter signs the voter's list to receive her ballot. Mobile ballot box. Election workers go to the homes of elderly and handicapped voters. 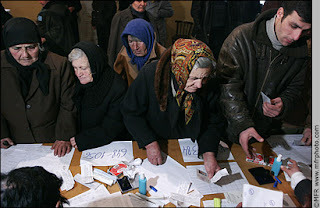 Voters crowd the registration table in a polling station in Dedoplistskaro raion, Georgia, during the Presidential election January 5, 2008. Election days are always interesting. 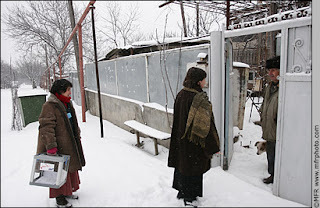 Yesterday I visited about 8 polling stations in small villages in Kakheti oblast. Some precincts were quite good — really, the best run I've ever seen in the former Soviet Union — while others had blatant problems. Speaking broadly, election day problems fall into two categories. Technical problems and corruption. Technical problems are common, and we saw many of these in Dedoplistskaro yesterday: an overcrowded polling station, equipment not working, polling station staff not following procedures. For example, in Georgia, voters are supposed to get their thumbs sprayed with invisible ink, and a staff member is to check each voter's thumb with a UV light when they enter, to be sure they hadn't already voted elsewhere. In one precinct, staff were forgetting to spray the ink about 1/3 of the time. In another, the woman at the entrance seemed only to haphazardly check voters; when I had my thumb sprayed and tested the UV light, it turned out she (1) didn't even know how to turn the light on and (2) once on, the light barely worked. These technical problems are typically due to poorly trained staff and overly complex procedures. Observers take note in the hopes that problems can be resolved in the next election. Corruption is common but takes close scrutiny to notice. In my years observing and photographing elections, I've seen more ways to cheat an election than I ever dreamt possible. Ballot box stuffing, multiple voting, changing numbers during the count, stealing ballot boxes, intimidating voters, bribing voters, threatening election commissioners, arbitrarily arresting candidates... the list goes on and on. So, in Dedoplistskaro yesterday, we witnessed little corruption ourselves but saw signs of it and heard complaints. In Kvemokedi village, government "coordinators" had been intimidating and coercing voters for two hours but stopped as soon as we arrived. We heard reports of 70 border guards who were being bussed from one village to another to vote repeatedly. The oddest moment was in Zemokedi, when two police officers (who are not allowed to be in polling stations unless specifically called in) were in the polling station when we arrived. They escaped to a back room when they saw us, and apparently escaped out the window! Often much of the cheating happens during the counting, or in the District Election Commission where votes are tabulated and relayed to the capital. We spent the night in the Signagi DEC, where some suspicious activities were going on. Unfortunately, we were unable to determine what was being hidden from us. We were repeatedly prevented from observing in the fax/computer room, although a large number of brutish unauthorized men were hanging out in there. At least some of them were campaigners for President Saaksahvili. It appeared that the preliminary turnout figures were being changed after the fact; this could enable those non-existent "voters" to "vote" later. What we observed was fairly mild compared to problems I've heard about elsewhere in the country. “These are the first competitive elections ever in this country,” OSCE Ambassador Dieter Boden said yesterday. 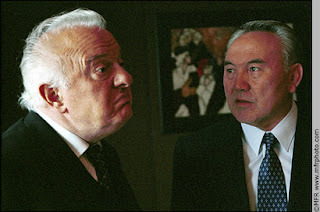 Former Georgian President Eduard Shevardnadze talks with Kazakhstan President Nursultan Nazarbaev in 2000. Eduard Shevardnadze, a former Soviet foreign minister, was President of Georgia from 1992 to 2003. 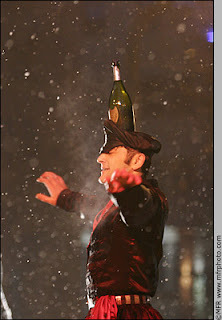 After an election with massive fraud and corruption, widespread protests culminated in the peaceful “Rose Revolution.” Protest leader Mikheil Saakashvili was then elected president in a new election in January 2004. Campaign posters for President Saakashvili are visible everywhere in Tbilisi. Now, four years later, some Georgians are dissatisfied with Saakashvili, there are accusations of corruption, and no one really has any idea what will happen on election day. I am about to leave for a few days near the Azeri border, around the hilltop fortress town of Signagi, so I will write more later. 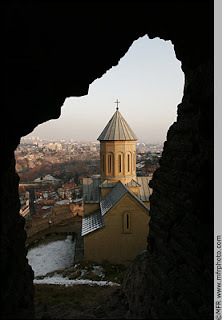 In Tbilisi, Georgia, a crumbling window in the Narikala Fortress, built in the 4th century, frames a view of St. Nicolas church and the old part of the city below. I had a few hours to wander around Tbilisi today. Lovely city. Too bad we don't have 2,000 year old buildings in America. 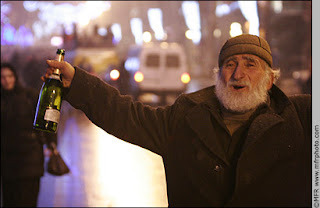 Happy new year from Tbilisi, Georgia. I'm here for 10 days covering their Presidential election. With a pause today for a little celebrating. I joined 15,000+ Georgians in Freedom Square to blast in 2008. 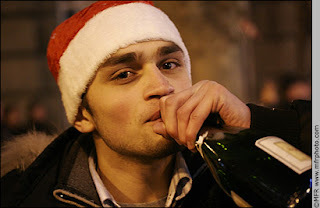 New Year's Eve celebrations here consist primarily of wine, music, wine, dancing, wine and firecrackers. Though it was crowded, I didn't take many crowd shots, but lots of pictures of sweet cuddly couples. Amidst all the hullaballoo, I was missing my sweetheart, regretting that we have now spent at least 33 out of the last 35 years apart at New Years. May you all have a joyous and peaceful 2008! Here are a few more shots from the festivities. (Click to see larger). Gregorian choir. Girl watching fireworks. Girl with sparkler. Dance troupe Rustavi.